After a late night in the city that never sleeps, having a dream mattress ﻿is crucial. We’ve put together this guide to choosing the best mattress stores in Las Vegas to help you on you get the best night sleep for the best price. Citizens of a city famed for its nightlife need their rest as much as anyone. If your sleep isn’t as restful as it used to be, it may be time to replace your old mattress. How often should you do so? The Better Sleep Council recommends replacing your mattress every 8 year or so- more often for economy models, less often for high-quality or latex mattresses. A small study from the same source demonstrated that subjects who switched to a new mattress reported enhanced sleep quality, lower stress and relief from back pain. Most Americans, however, put off replacing their mattress for closer to 10 years, with the expense and hassle of mattress shopping as their primary reasons. You may be considering an upgrade to a new model but are stuck wondering where’s the best place to buy a mattress in Las Vegas? 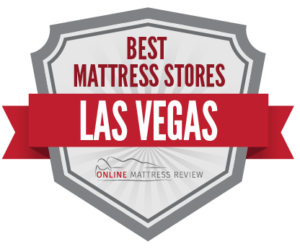 We’ve scoured the listings and reviews of mattresses stores in Las Vegas to bring you the highlights in each geographic area. Read on and find out the best place to buy a mattress, in your budget and comfort style, and right in your neighborhood. There are quite a number of places to buy a mattress in central Las Vegas. As with other parts of the city, branches of Mattress Firm and Best Mattress can be found in this area. There’s a Best Mattress right downtown (260 S Martin Luther King Blvd) and, nearby, Mattress Firm Rancho Oakey (80 S Martin Luther King Blvd). In contrast to these traditional chain mattress retailers, Dormeo (495 S Grand Central Pkwy) sells alternative and innovative “hydracool” mattresses, constructed as a fusion of coil and memory foam technology, resulting in an extremely breathable mattress. This type of model is well-suited for those seeking a cool, breathable mattress, such as customers who have night sweats. A few blocks away, Las Vegas Luxury Beds (495 S Grand Central Pkwy) gets a 5-star average Google review, and is an ideal destination for those in search of the finest mattress money can buy. The store stocks meticulously handcrafted brands such as Vispring, Carpe Diem, and Kluft, as well as natural latex beds by Savvy Rest and Aireloom. The expert staff has more than 6 decades combined experience in the sleep industry, and are able to guide customers to the ideal sleep solution for their body type and comfort preferences. Sterns and Foster (455 S Grand Central Pkwy), the popular mattress manufacturers, have a showroom in the same area, where customers can browse their full line of models, which include collections at several price points, as well as crib mattresses and bedding. is a smaller discount retailer just a few blocks away, making comparison shopping a breeze. Much like Mattress Warehouse Plus Furniture, HalfPriceFurniture (1925 W Craig Rd) has a strong reputation for deals on both mattresses and furniture in North Las Vegas. The store offers affordable mattresses in orthopedic, pillow top, memory foam and eco models, though the inventory varies widely based on the closeouts they acquire. Customers give high marks to the prices and free, fast delivery. There are also three Mattress Firm locations in the area: Mattress Firm North Las Vegas (2020 W Craig Rd), Matress Firm Alliante (6512 N Decatur Blvd), and Mattress Firm Clearance (6515 N Buffalo Dr). At the Clearance location, customers can find an extremely affordable mattress if they are flexible as far as the particular model. Mattress Firm Clearance stocks overstock, closeouts and discontinued models, cosmetically imperfect mattresses, as well as those mattresses returned by customers within the stores 120-night exchange period. One of the best-reviewed places to buy a mattress in South Las Vegas is Las Vegas Discount Beds (1214 Wigwam Pkwy), where customers appreciate the great customer service and affordable mattresses. This locally owned and operated wholesale mattress store sells deeply discounted closeout inventory in pocketed coil, hybrid, gel and memory foam models, and customers save an average of 50%-80% on their purchases. Another top-rated option is Sleep Well Las Vegas (2960 Westwood Dr. This independent, locally-owned mattress shop gets excellent reviews for high-quality and low-priced products, which come in memory foam, coil, latex and even custom mattresses, as well as beds and cox springs. Best Mattress has the greatest number of mattress stores in South Las Vegas overall, with a store in Warm Springs Promenade (1205 W Warm Springs Rd), by Sunset park (7161 S Eastern Ave), by highways 215 and 15 (7220 Dean Martin Dr) and by Enterprise (4120 Blue Diamond Rd). BMC Mattress in East Las Vegas is another excellent place to find an affordable mattress. BMC Mattress is the nation’s largest liquidator for popular mattress bands like Sealy, Posturepedic, Optimum and Stearns & Foster. The store offers discounts of up to 60% off retail on returns, new, factory close-outs, overstocks, and discontinued floor models. There are also two locations of Mattress Firm in the area: Mattress Firm Las Vegas East (196 N Nellis Blvd) and Mattress Firm Warm Springs (410 Marks St). This chain is the nation’s leading mattress retailer, and customers at both locations praise the wide selection and attentive, knowledgeable sales associates, who work patiently with each customer without pressuring them to make a purchase. Finally, Sleep Number (1124 W Sunset Rd) is another longstanding and widespread national chain. Sleep Number uses a special bed with high-tech sensors, as well as customer consultations, to determine each shopper’s ideal mattress, and match them with the best fit. Their beds include options from luxurious comfort layers to innovative temperature balancing fabrics to address conditions from snoring and night sweats to back pain and insomnia. Rainbow mattress and Furniture (6045 S Rainbow Blvd) has an almost-five star Google rating, with customers praising this locally-owned furniture and mattress-store’s low prices, same-day delivery, no-pressure sales assistance, and professional customer service. Another independently owned and highly-rated mattress store in West Las Vegas is MyFit Mattress & Furniture (4235 S Fort Apache Rd). This store specializes in gel and latex mattresses, adjustable beds, and massage chairs, and has a 5-stay Yelp rating. There are plenty of good Las Vegas mattress stores to choose from and we hope you find the perfect night sleep.